Thank you al for the birthday wishes for Kira's birthday. She had a awesome time, and really felt like a princes.. Here you also can see the beautifull back of the dress..
Then my little neighbor boy turned 1 year just before New Year's eve, and his mother likes owls. So I thought maybe it would be nice to make a owl rattle. I made it without a pattern, just looked at a pinterest pin. Happy that the little boy was.. he put it in his mouth. It also makes sounds so a great job on it. 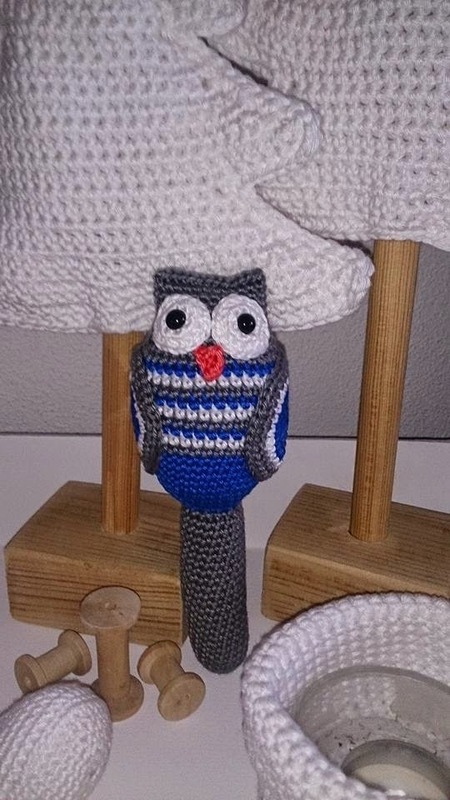 Those are beautifull crochet dolls, soon I'm going to make a real big one. But for start I wanted to make a mini. Those pattern are re-designed by many people in to mini's. And those are really tooooo cute too. I crochet het with Stone Washed, love love love this new thread, The face/hands/scarf are made with Catania. 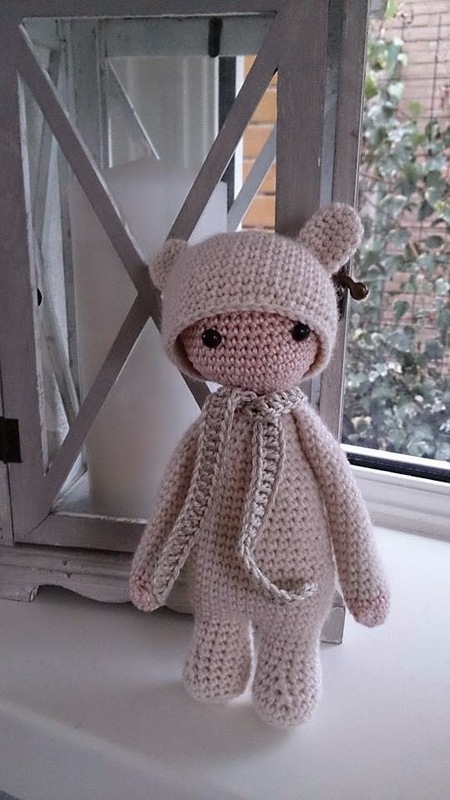 More Lalylala's and mini Lalylala's will come this year.. a awesome pattern and easy to make. Baking is back in our home ( never was really gone). And kids are making it now all totally alone..
Want do you think , should they like it?? 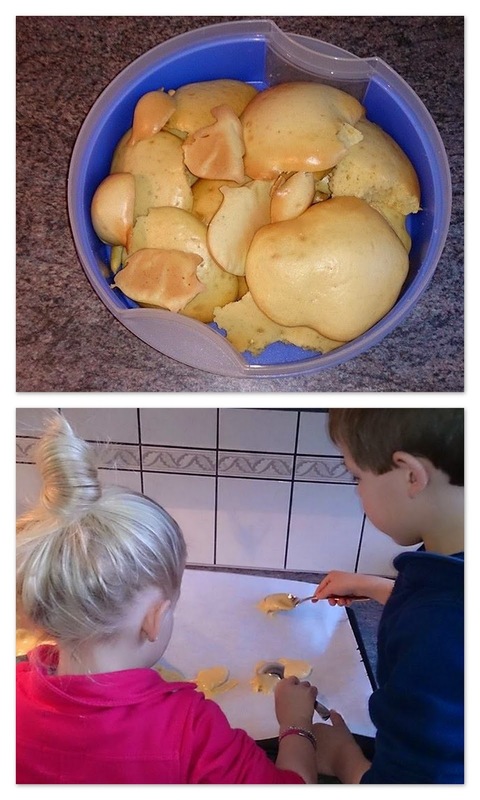 It has been more then a year ago that we made these.. ( bad bad mommy) but the cookie yar was full again with this egg-cookies, only egg's, sugar, flour and baking powder... but so so yummy.. Kids take them to school. Then this is a new thing, and it will not be the last time I ( we) made them. yum yum.. are you drooling already??? Just make Pancake mix, put it in a muffin tin. 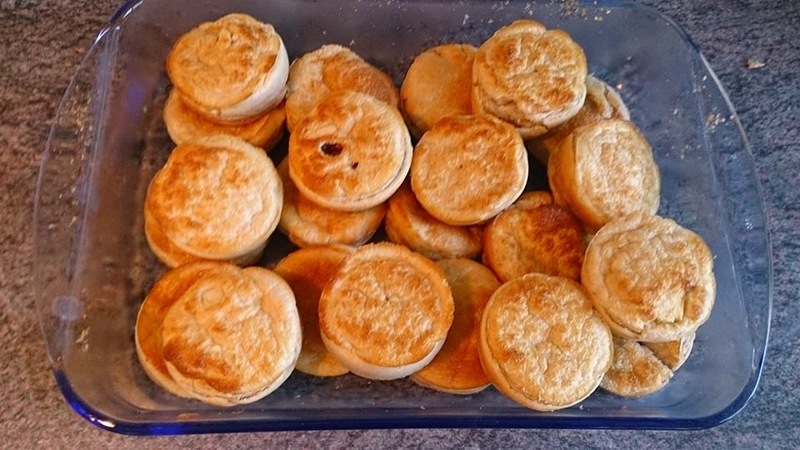 One tin was made with only the mix, in teh other one we did raisins and apple. As you can see the kids did it all. I only told what they had to do it, how to do it, and how much. So we can conclude they where very yummy. 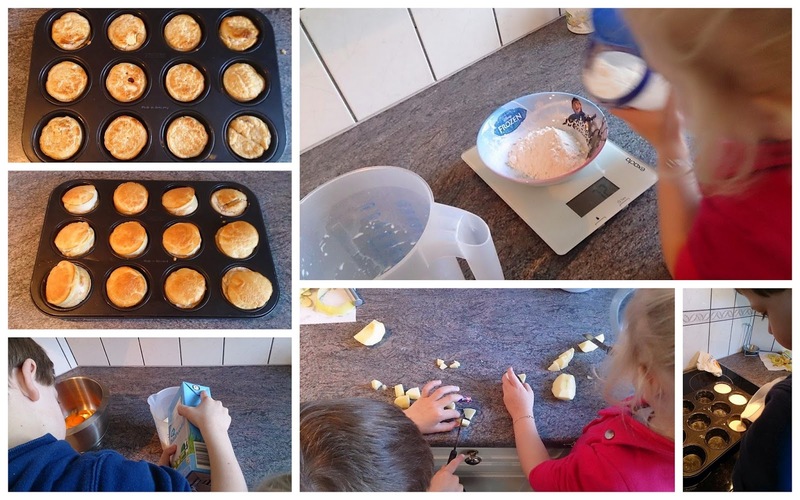 Since two weeks I bake every Tursday in Noah's class in school. There I tryed these both recepi's too. I'm already thing of what to bake next.. so more baking will come. 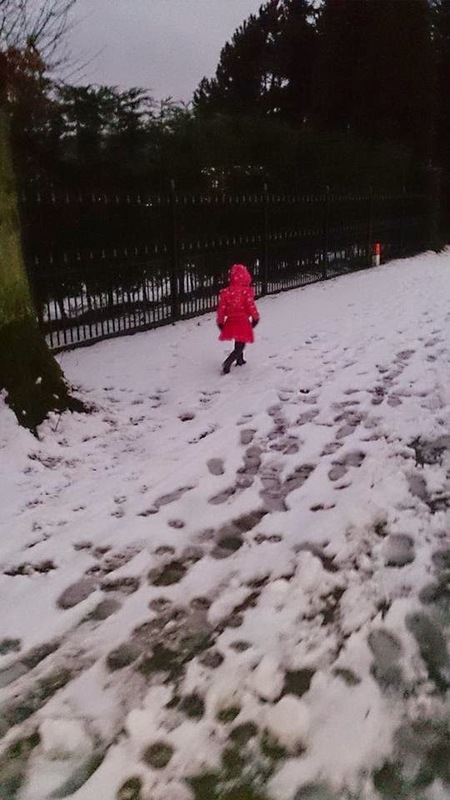 As Kira turned 4 years, she now also goes every day to school..
How about you having snow??? Since the great snow we had on third Xmas, it was not much..
Where is the 15 cm I ordered???? 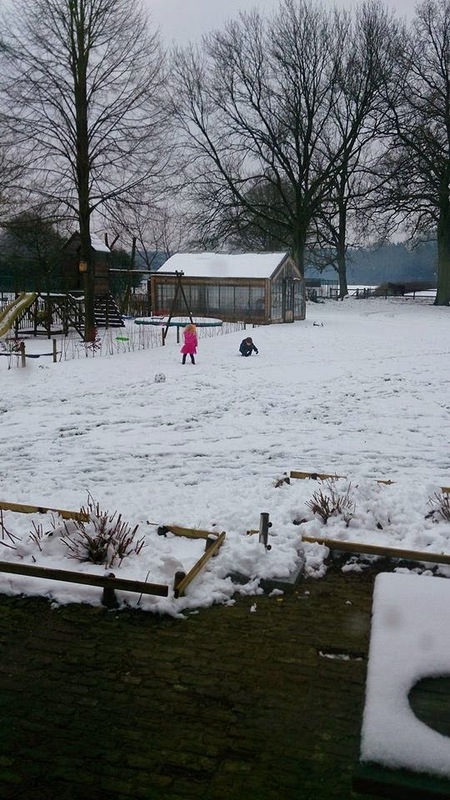 But thankfully last week at my Sil's they had a lot of snow in Belgium, so Kids could play. 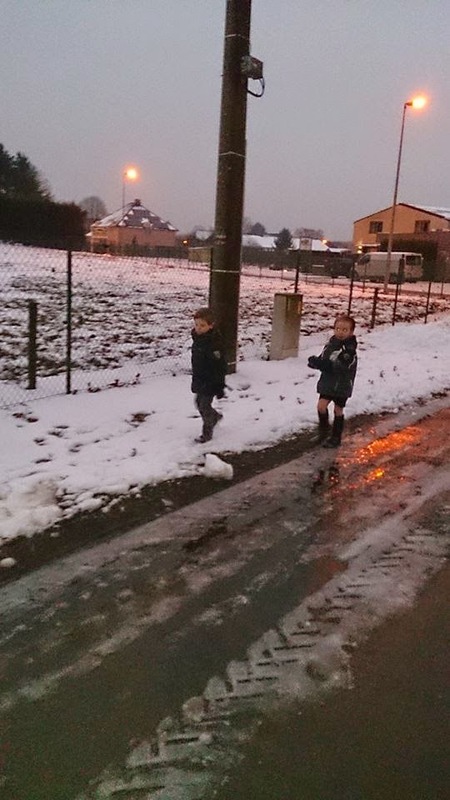 They are so happy when they see snow. I just got home from work, now it after midnight, I think I'm off to bed.. busy weekend in front. Kira haar haar zit erg mooi. Leuk om helemaal op de baktoer te zijn. 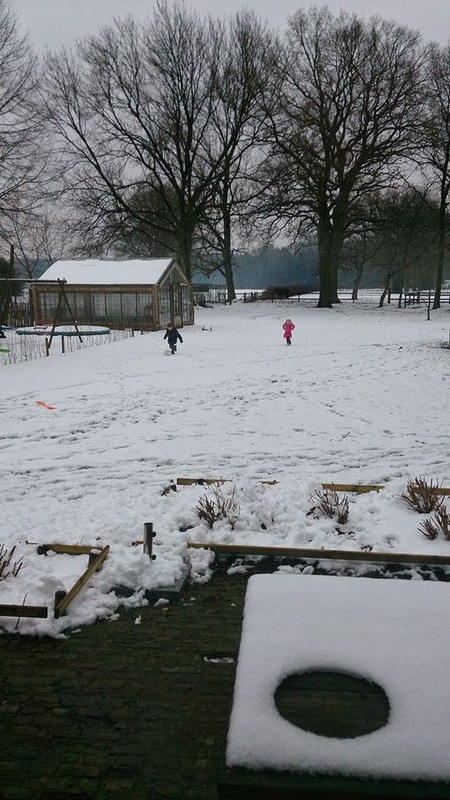 Past bij de winter. En knap dat ze het al zelf kunnen. 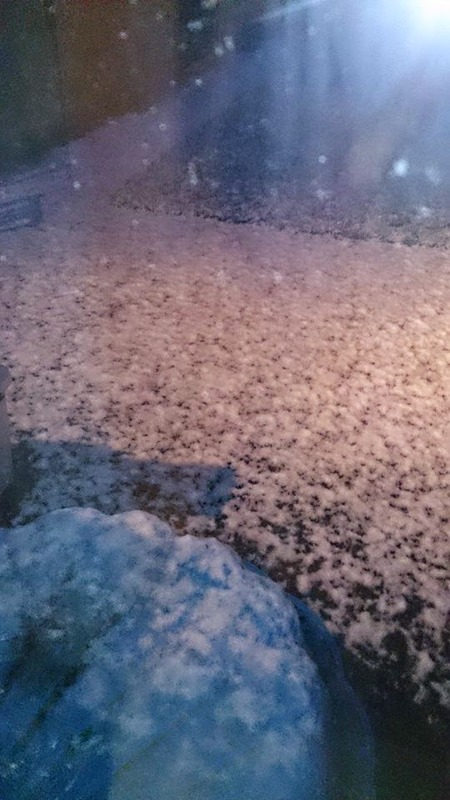 Hier bij amsterdam lag gisteren wel een flinke laag sneeuw. Nu alles bijna weg. Love that braid! Your crocheting is so adorable. The owl was really perfect for a little boy. Nice to see the cooking and eating still going on. 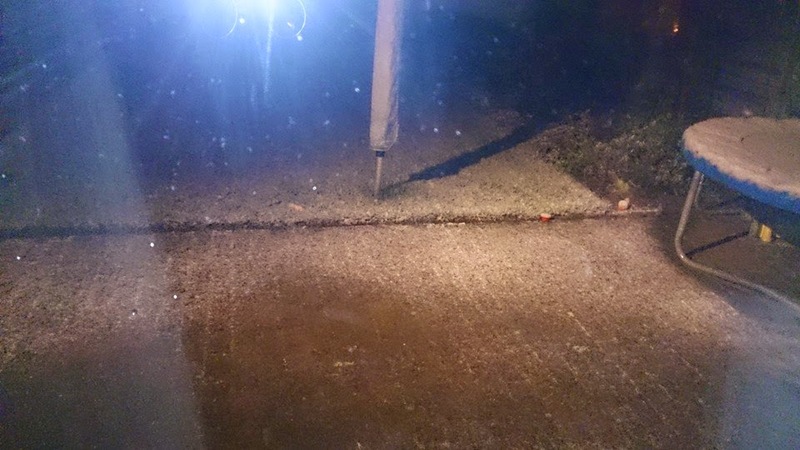 Very cold here, smattering of snow, but plenty of mixed precip to tie up traffic! Happy belated birthday to Kira!!! I'm sure she is just loving school although your heart hurts to send them off...I will be there soon-4years! Love the little crocheted dolls! 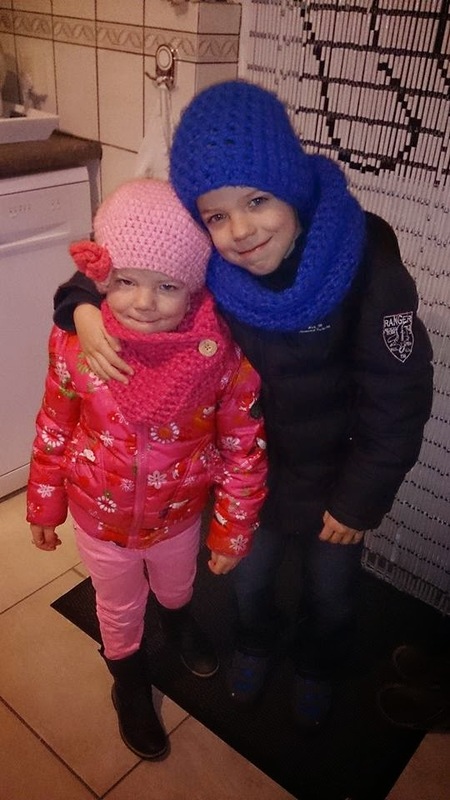 They are so sweet! 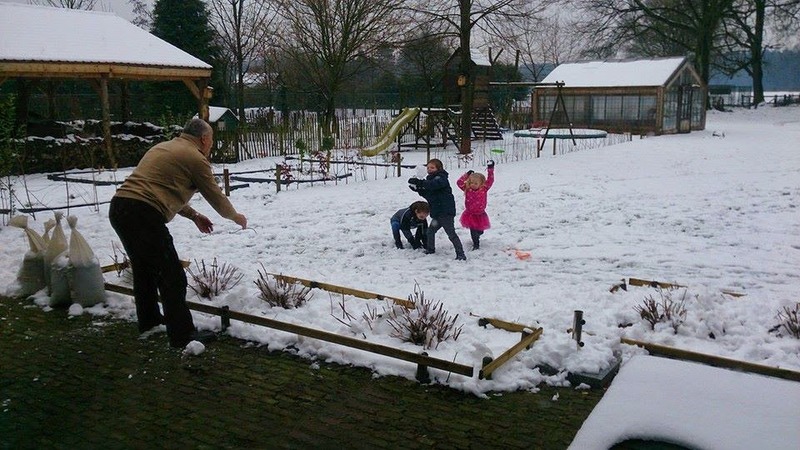 Yay for snow and snowfights with Grandpa!! Hugs!! Kira's hair looks lovely as well as her dress. Hmmm, the baking sounds yummmmy. 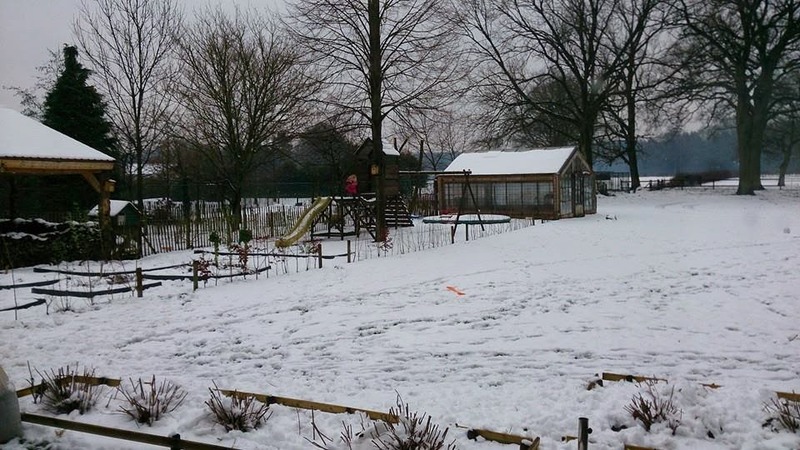 Beautiful snow pictures and kids and Grandpa having fun. 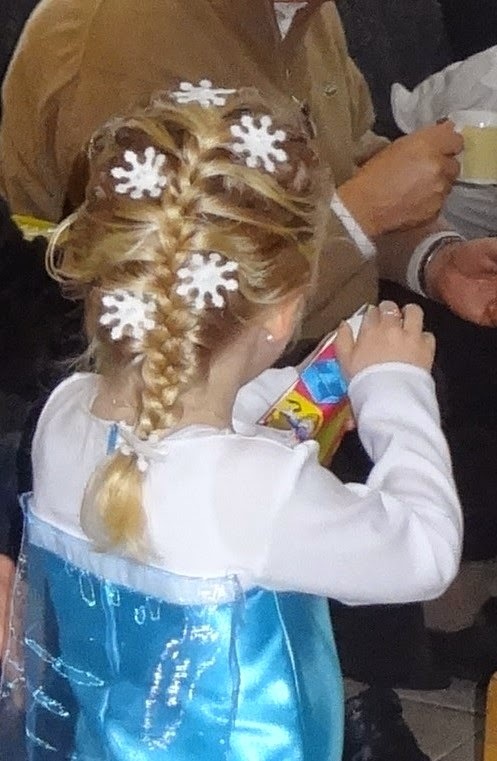 We haven't seen snow over here..
Kira's hair is so beautiful, Annette--like a frozen princess :) You always have the greatest ideas for dress-up, crafts, and baking--a fun mommy!! Your newest crocheted animals are so cute and the kids baking looks very tasty. Your husband doesn't like pancakes??? Oh, my!! So sorry your home is feeling a bit empty with Kira at school all day, but just think of all the extra time you'll have to create! !